Story by Crystal Gabrielle. Photos Copyright © Crystal Gabrielle. AS PART OF MY ongoing house-sitting adventures, I’m house sitting right now in Tucson, Arizona. 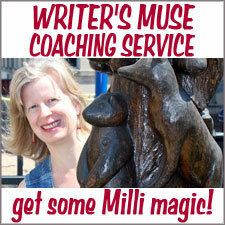 My work is portable (writing coach) so I bring it with me on house-sitting jobs. I was planning to have an adventurous summer but got bogged down in work instead. I became so over-worked I felt in dire need of rejuvenation. That’s when I remembered my long-standing desire to walk a labyrinth. Instinct told me Tucson would make that possible for me. 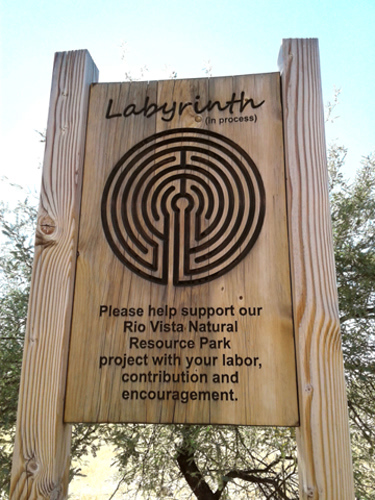 Sure enough, when I Googled labyrinths in Tucson, I found one a mere ten minutes from the house, at the back of Rio Vista Natural Resource Park with an up-close view of the Santa Catalina Mountains. Rio Vista is a 40-acre park with pathways for bike riders, pedestrians and equestrian use. There’s a fully paved sidewalk-type path that you can stroll on without venturing into the mini-wilderness; the rest is wide dirt pathways through desert landscape. It was way more challenging finding the labyrinth than it should have been! Later in this story I’ll tell you exactly where to locate it within the park. I’d also read they can be used for seeking answers from within. I decided to ask my inner self about something that was bothering me. Before entering the labyrinth, I paused at the opening and formulated a question in my mind. I was alone at the labyrinth so I also asked my question out loud. As I walked, I mostly focused on the visceral experience. Occasionally I reminded myself of my question. 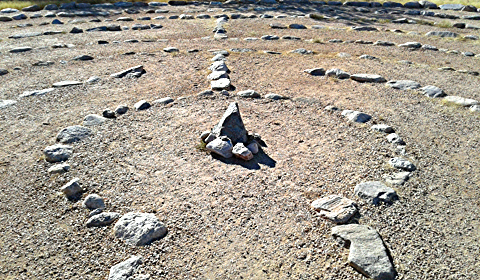 When I got to the center of the labyrinth, as recommended I paused on the journey. It’s said to be a journey to the center of yourself, and then back out into the world. I was there during the hour before sunset and got to see the glorious colors touching one of the four mountain ranges that surround the city—Tucson Mountains to the west. 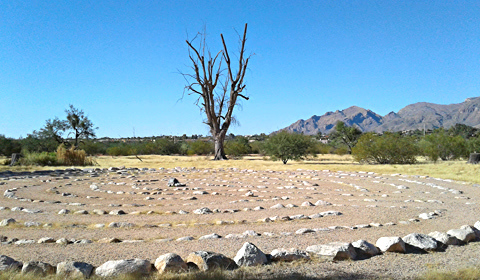 Full moon labyrinth walks are conducted by Web of Life Labyrinth Tucson. At these events, the labyrinth is marked out with lit candles. Drums and rattles are used to enhance the trance-like effect of walking the circuit. The full moon can be absolutely enormous here in Tucson, so this must be quite the spectacle. I missed it last night, but I’m hoping to attend during the next full moon. The park does have a green center where kids can run around on regular grass. 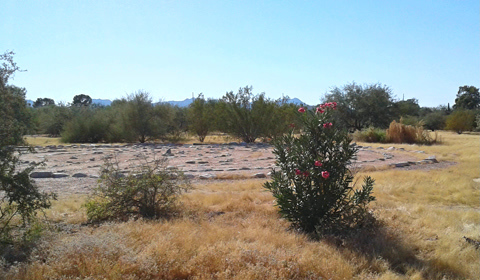 But mostly Rio Vista Park, a former ranch, features desert landscape sans cactus. At first it can seem a little drab in parts, until you really take a good look. As I was walking the labyrinth, the yellows, browns and dark greens all seemed more vibrant. 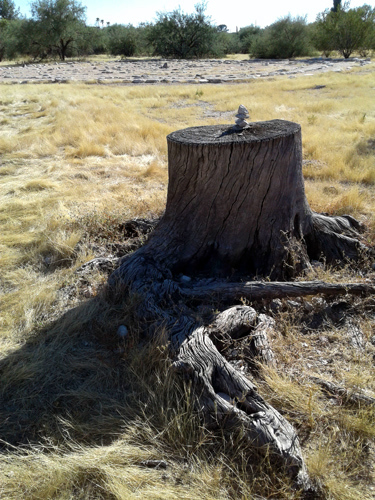 Next to the labyrinth I found this study in zen, a tiny cairn sitting on a tree stump. It set me to wondering what it signified and why someone had placed it there. With its backdrop of labyrinth, this whimsical touch felt like a micro/macro message (rocks lovingly arranged on both a small and large scale). The roots of the tree look ancient and convoluted, which seems to match the labyrinth as well. The park feels like a safe place and lots of parents take their kids there to romp in the playground. It’s also a wild place right there in suburbia where you may encounter coyotes, owls, bobcats, rabbits, birds, rodents and snakes. I saw a rabbit and lots of medium, small and adorably tiny lizards darting around. While I was in the labyrinth I saw a vibrant-tinted red bird land on the pink flowers. 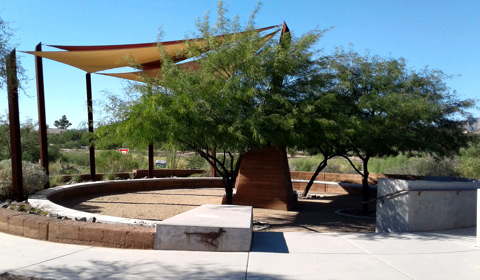 The park has a green center with a shaded playground and picnic tables under ramadas. The Santa Catalina Mountains look lovely against the green grass and trees, especially if you’ve been walking in some of the more deserty parts of the park. And speaking of desert, where water is precious . 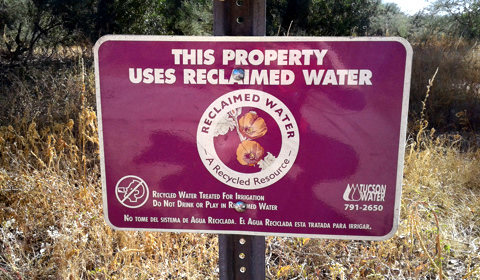 . . the city of Tucson uses reclaimed water to irrigate the green space. 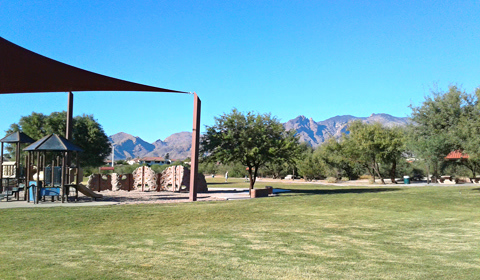 If you’re walking much in the park you’ll be glad of the shaded areas, such as these shade sails and big bushy tree; an amphitheater where you can drink in the beauty of the Catalinas as seen across the Rillito River. I could not see any water in the river bed, just masses of undergrowth where hummingbirds zoomed in to look for food. The view of the Catalinas includes Pusch Peak, Bighorn Mountain, Table Mountain, Finger Rock, The Guard, Mount Kimball, Window Rock and Cathedral Rock. The highest point is Mount Lemmon (9,157 feet above sea level), which receives 180 inches of snow annually. Mount Lemmon is a popular destination for both tourists and locals, with its own ski valley (southernmost ski area in the United States), a popular observatory and private cabin rental. Be sure to bring plenty of water and sunscreen when visiting the park. The second time I went was in early October and the sun, even at 4 pm, was scathing. 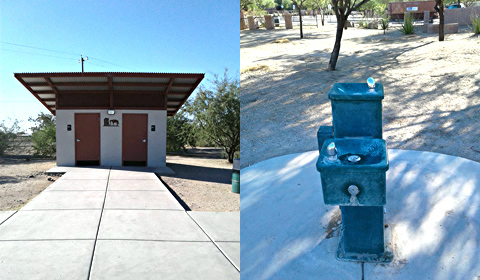 If you run out of water, there are drinking fountains near the park entrance. Public toilets are centrally located at the rear of the parking lot. It’s easy to get to the park. Head north on N Tucson Blvd until you reach the very end of it. Turn right into the park entrance. After that, I wandered around looking for signs to lead me to the labyrinth. There were none. 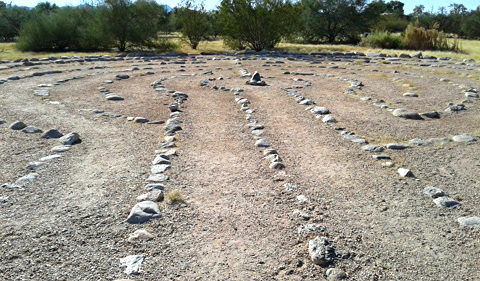 The only sign in the entire park that relates to the labyrinth is right next to it, which is no help when you’re lost. I was about to give up when I decided to try one more thing. Starting over at the parking lot, I kept right and took a wide dirt path heading roughly east. I reached this little junction marked by a garbage can, the corner of a barb-wire fence and a sign about watching for coyote cubs. I veered right onto this pathway. I continued to keep to the right. Eventually, over the tops of the brush, I saw two people walking in a contemplative sort of way and had a “Eureka!” moment. I’d found it. Lucky for me, the man and woman were done with their walk and I soon had the labyrinth all to myself. 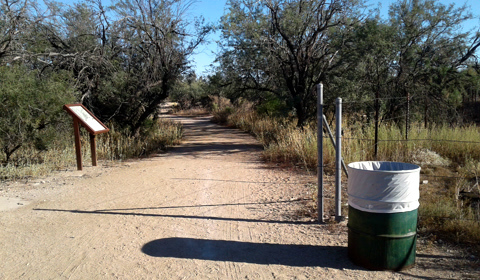 If you follow my directions to get to the labyrinth, once you get past those three very notable landmarks—garbage can, fence corner and coyote sign—be sure to take notice of how the dirt path unfolds. If you don’t, you may end up a little lost on your way back to the parking lot. The scenery can look very same-ish in parts of the park. Please leave a comment below and share your own labyrinth experiences! Crystal Gabrielle is a double Aquarius with a vast interest in metaphysical subjects, as long as they’re fun. She’s been a house sitter in various parts of the Southwest and California, and she enjoys getting on the road. She embraces anything that brings more magic into life, and she’s not afraid to talk to herself out loud when a good idea possesses her. 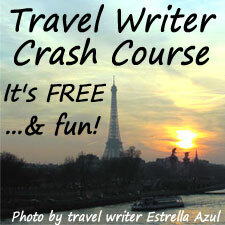 Check out Crystal’s tarot reading gig at Fiverr and her travel-related Kindle book, House Sitting Secrets Revealed. Wasson Peak via King’s Canyon Trail: An awesome way to start a Tucson day!